South Korean companies make comparatively lower-end (mid-technology) medical devices, therefore depends on U.S., Europe and Japan to supply about 60% high-end medical devices of total market demand. The import of medical devices need the assignment of an importer or representative based in South Korea to manage medical device approvals and to ensure regulatory compliance. As part of pre-market approval requirements, the Government of Korea requires testing reports on safety and efficacy. In addition to medical device approvals, companies need to negotiate pricing terms with the Korean Health Insurance Review & Assessment Service (HIRA). Goldstein Research analyst forecast the South Korea medical device market size is set to reach USD 5.0 billion by 2025, at a CAGR of 6.1% over the forecast years. South Korea’s healthcare market is ranked fourth among countries in the Asia-Pacific region. The combination of increased insurance coverage, an aging population, and government initiatives to expand the healthcare market make South Korea a prime destination for Western medical companies looking to go abroad. The report covers the present ground scenario and the future growth prospects of the South Korea medical device market for 2017-2025 along with the data of shipments of medical devices and number of labs and hospitals in South Korea. We calculated the market size and revenue share on the basis of revenue generated from major players across the country. The medical device market is forecasted on the basis of revenue analysis, product benchmarking and strategic developments of key market players. The report also includes micro and macro factors essential for the existing market players and new entrants along with detailed value chain analysis. Based on product type, in-vitro diagnostics (IVD) equipment dominated the South Korean medical device market and accounted for the market share of 35% in 2017 owing to large number of ageing residents with multiple chronic health issues. Surgical and medical instrument is the fastest growing segment with a growing CAGR of 7.23% over the forecast period due to growing demand for devices that manage disability and chronic pain and improve recovery times. South Korea Medical Device Market Outlook 2017-2025, has been prepared based on an in-depth market analysis from industry experts. The report covers the competitive landscape and current position of major players in the South Korea Medical device market. The report also includes porter’s five force model, SWOT analysis, company profiling, business strategies of market players and their business models. South Korea Medical device market report also recognizes value chain analysis to understand the cost differentiation to provide competitive advantage to the existing and new entry players. 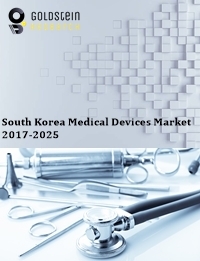 Our South Korea Medical device market report comprises of the following companies as the key players: Johnson & Johnson, Philips HealthCare, Medtronic Inc., GE HealthCare, Siemens AG, Novartis AG, Stryker Corp., 3M Company, Abbott Laboratories, Toshiba Corp., Becton, Dickinson and Co., Baxter International Inc., Cardinal Health Inc., Boston Scientific Corp., Allergan Inc., Zimmer Biomet, Danaher Corp., Dentsply Sirona, Essilor International S.A. and Covidien plc. According to the report, major driving factor is that Korea offers a high-quality, western-style medical and scientific infrastructure for clinical research at Korea’s leading hospitals with state-of-the-art facilities which are highly professional and efficient in conducting and supporting trials. For instance, Korea also has highly ranked biotech research institutes and high-tech medical clusters. The government has supported the construction of a network of Clinical Trial Centers at 15 major regional medical centers across Korea and more than 164 investigational trial cites nationwide. Further, the report states the biggest challenge is the localization of medical devices which hamper the market share of major players, reimbursement pricing and the new healthcare technology assessment system for medical devices. In the emerging markets, local medical device manufacturers are more successful as compared to their multinational counterparts because the local players offer tailor-made products aimed at resolving local needs and constraints. The local medical equipment manufacturers often indulge in market research and leverage the benefits of local operations and a domestic sales force to bridge the gaps in the market. In 2017, total imports of medical devices were estimated at USD 3.0 billion, with U.S. imports totaling over USD 1.4 billion in South Korea. The South Korea medical device market is driven by elderly population in Korea accounted for approximately 13% of the total population in 2015 and many local doctors are educated in the U.S. and Europe and are accustomed to using advanced medical devices from overseas. Under Korean law, medical device manufacturers must comply with Korea’s Good Manufacturing Practice (GMP). GMP approval is required for all Class II, III, and IV devices.